To some people it’s a ‘lovely, lovely lane’; to others ‘the worst b****y road in the south’. To Dutchman Pieter Boogaart and his wife Rita, it is the Epitome of England. 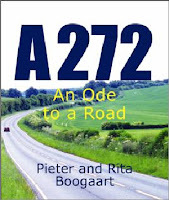 A272 An Ode to a Road was written and designed to prove their point. It instantly became a cult classic when it was written and it’s been reprinted many times. It has been out of print for some years now – but, this 11th anniversary edition has been revised, augmented and improved by Pieter and Rita; AND AT LAST IT’S BACK AND IT’S 272 PAGES LONG! 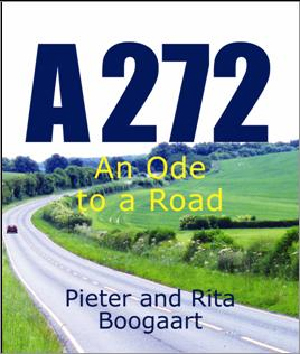 A decade-old obsession for Dutchman Pieter Boogaart resulted in a guidebook that looks like no other, on a subject never previously fully explored … the A272. Three continuous texts wind their way through the book, simultaneously exploring the A272 itself and the countryside it passes through; extra commentary is provided in yet another level of text. Hundreds of colour photographs complete this homage to the ‘epitome of England’. Pieter Boogaart is the European Secretary of the Folly Fellowship. A noted book reviewer and teacher, he lives with his wife and collaborator Rita (an art historian and lecturer) in the Netherlands. This book is crazy, informative and hugely enjoyable. Jeremy Paxman on Newsnight called it “Astonishing”. Art Quarterly called it “A Bound Folly”. And he in fact bought me lunch because I found it for him.
! But yeah, thanx for spending some time to discuss this issue here on your site.